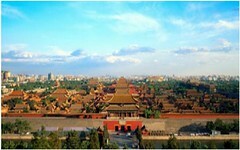 The city of Beijing swirls around the mystery of the Forbidden City of China. Also known as the Imperial Palace Museum, it has almost 10,000 buildings splayed across 250 acres – the enclosure housed the emperors of the Ming and Qing dynasties for around 500 years. A behemoth of a national landmark, its inner workings hold thousands upon thousands of China's rarest treasures and artifacts. It should be no surprise that the Forbidden City of China is one of the premier places for tourists to visit. Its convenient location to the greater Beijing area certainly doesn't hurt, either. The wall enveloping the Forbidden City China measures almost 30 feet in height. Held inside is the world's largest palace complex. The Forbidden City history begins in 1407 when over a million laborers began its construction. Thirteen years in the making, the interior is a violent yellow. The bricks that layer the ground, the roofs that rise into the sky, numerous decorations and shrines throughout the Forbidden City of China: all a similar shade of yellow. This is because the traditional color of royalty in China is, of course, yellow. Until 1911, when the revolution finally came to the streets of Beijing, this was where the emperors lived, where they governed, where they prayed. The Forbidden City China is divided into two main parts. The outer court is where the emperors governed; the inner court is where they, along with the rest of the royal family, lived. The two are separated by the immense Gate of Celestial Purity. But first you have to get inside - the main gate to the Forbidden City is located to the south, opposite Tiananmen Square. This gate, also called the Meridian Gate, is famous for its resemblance to a phoenix. Like most of Chinese architecture and surroundings, most every aspect of the Forbidden City has a nickname – every hallway or courtyard is an ancient symbol, every nook and cranny has some secret meaning. The maze of walls and buildings is also strictly governed by the rigid principles of Feng Shui, the certainty of which gives the many structures an austere and stoic quality to them, the knowledge that everything is in its right place. Harmony is an important, and repeating, theme to these hallowed grounds of the Forbidden City China. Reminders of the virtues of Confucius also litter the inner and outer courts, both in name and in spirit. If the enclosure has one major centerpiece, it is The Hall of Supreme Harmony, where emperors decreed laws for the Chinese people. The Hall of Central Harmony and Hall of Central Harmony are close contenders for this title, however. And these are just a couple of the numerous halls that are spread throughout the Forbidden City of China. One of the most historically and culturally significant remnants of the former Chinese empire, it is also one of the busiest in regards to tourists. Even in the dead of winter, the crowds can be excruciating. The best time to wander the exquisite grounds is early in the morning, when the silent morning adds to the serenity and power of China's past glory. Phongshan Park stop or Tian Am Men stop. Take subway.